The optimism for restoring balance in the City of St. Louis’s legal environment described in last year’s report quickly evaporated in 2018 as massive verdicts, blatant forum shopping, and legislative ineptitude plagued the “Show Me Your Lawsuit” State. A reasonable observer would have to conclude that Republican lawmakers, who hold the majority in both legislative chambers, either condone lawsuit abuse and thus are aligned with the Missouri Association of Trial Attorneys or are incapable of taking on a wealthy entrenched interest. Either way, Missouri’s “Show Me Your Lawsuit State” nickname will remain as will the status of St. Louis as a Judicial Hellhole, so long as policymakers continue to pledge their allegiance to wealthy personal injury lawyers. As chronicled by the city’s inclusion in multiple Judicial Hellholes reports, St. Louis has quickly emerged as one of the nation’s leading litigation hot spots. As Bloomberg Business noted, St. Louis “has developed a reputation for fast trials, favorable rulings, and big awards.” Loose venue rules and St. Louis judges’ reluctance to properly apply U.S. Supreme Court precedent have encouraged out-of-state plaintiffs to flock to the jurisdiction. The greatest example of this abuse is the talc litigation currently working its way through the Missouri court system. Lawsuits alleging a connection between use of Johnson & Johnson’s talcum powder and ovarian cancer in women is certainly nothing new in St. Louis; however, it reached new heights (or lows) in July when a St. Louis jury awarded $550 million in actual damages and $4.14 billion in punitive damages to a group of 22 plaintiffs. The women claimed that their ovarian cancer was “caused by exposure to asbestos allegedly found in Johnson & Johnson’s baby powder.” Of the 22 women involved in the lawsuit, 17 had no connection to Missouri. Each was awarded the same amount of money, despite there being “different facts for each, and differences in relevant law.” Jurors deliberated for less than a full day after a six-week trial. Johnson & Johnson plans to appeal the decision on multiple grounds, including whether St. Louis was the proper venue for the case. Johnson & Johnson was successful in overturning a previous St. Louis jury verdict in a similar case when a Missouri appellate court held that the verdict could not stand in light of the jursidictional requirements outlined by the U.S. Supreme Court that require a connection between the claim and where it was filed. In that case, the plaintiff was a South Dakota resident and filed her lawsuit against the New Jersey-based company in St. Louis, Missouri. Another Johnson & Johnson venue appeal is currently pending before the Missouri Supreme Court. The Court is deciding whether St. Louis city Judge Rex Burlison improperly allowed a case to go to trial that was originally filed in St. Louis County Circuit Court. Judge Burlison has allowed plaintiffs’ attorneys to manipulate rules that permit combining the lawsuits of multiple plaintiffs in some circumstances and has consolidated hundreds of cases involving plaintiffs from outside St. Louis with cases brought by St. Louis residents. After a St. Louis city jury awarded $72 million in the first talc trial, lawyers began engaging in “blatant forum shopping” to ensure a maximum payday for their clients and St. Louis judges have allowed it to continue. Even in generally plaintiff-friendly New Jersey, a judge in September 2016 dismissed two talc cases scheduled for trial after deciding that the plaintiffs’ experts who had testified in St. Louis were not qualified to testify in the Garden State. Nevertheless, defendants’ pleadings to have those so-called experts excluded from St. Louis trials fall on deaf ears. Despite passing legislative reform in 2017, judges there invariably allow this junk science and, with visibly ill women or their surviving loved ones as sympathetic clients, practiced personal injury lawyers play to the jurors’ emotions and persuade them to come back with outlier verdicts that fly in the face of genuine science. Plaintiffs’ lawyers have long abused the state’s consumer protection law, the Missouri Merchandising Practices Act (MPPA), filing shakedown class action lawsuits alleging that product labels, advertisements, or other business practices are misleading where no reasonable consumer has been misled or lost money. They take advantage of a 2016 Missouri Court of Appeals decision that subjects companies to lengthy and expensive litigation, including a full jury trial, even for the most ridiculous of claims. For example, the City of St. Louis and certain other counties have experienced a wave of “slack-fill” lawsuits targeting various candy manufacturers, including Skittles, Reese’s Pieces, and Junior Mints. Plaintiffs claim the candy makers engaged in “deceptive marketing” because the packaging was not filled to the brim with candy— notwithstanding the fact that content weights were clearly printed on the boxes. A small group of attorneys have created their own profitable cottage industry in Missouri by filing these types of lawsuits. All they have to do is find a willing plaintiff. The Hershey Company and Tootsie Roll Industries are among the recent targets. The Missouri Supreme Court has developed a reputation for being particularly friendly to plaintiffs. For example, contrary to most other state courts, the Missouri Supreme Court has struck down limits on noneconomic and punitive damages, and adopted an expansive tort claim for medical monitoring. That concern continues in 2018, the state high court set a dangerous precedent when it reinstated a verdict that was tainted by juror misconduct. Sherry Spence filed a lawsuit against BNSF after her husband was killed in 2012 when a BNSF train struck his truck as he crossed railroad tracks. During the two-week trial in Stoddard County, now-retired Judge Stephen Mitchell issued 81 rulings—80 of which were for the plaintiff. Ultimately, a jury found the railroad 80% at fault for failing to maintain proper crossing conditions. It returned a $20 million award, which was later reduced to $19 million. Following trial, defense counsel learned that one of the jurors, Kimberly Cornell, did not truthfully answer questions during jury selection about her family’s litigation and automobile accident history. During questioning, she indicated that she had never been a party to a lawsuit, never made a claim against another to recover money for physical injuries or damage to property, and did not indicate, when asked, that she had been a party to a lawsuit or that any close friends or family members had been involved in a motor vehicle accident. Unbeknownst to BNSF, Ms. Cornell had been a plaintiff in six other cases, including a wrongful death case arising from an auto accident that killed her son. This information was not discovered by BNSF during jury selection because her last name was mispelled “Carnell” on a juror questionaire and subsequent court documents, but she did not correct it. Four hours prior to the jury being seated and sworn in, however, the court clerk provided the lawyers with a new seating chart with the correct spelling of Ms. Cornell’s name. At that point, it was too late for defense counsel to conduct additional juror research. After the verdict, the plaintiff claimed BNSF knew the juror’s name was misspelled. The court clerk testified that she caught the error and told “one of ” the defense lawyers—although, she could not remember if it was the 5’5″ female attorney or the 6’4″ male attorney. Nothing in the record reflected this “notice,” except a hand-written note on a single undated document. BNSF counsel stated in an affidavit that they in fact were never made aware of the error. After the trial court let the verdict stand, the Missouri Court of Appeals ordered a new trial. The appellate court found BNSF clearly asked jurors about their litigation history and ruled that the trial court abused its discretion when it found BNSF was not prejudiced by the juror’s nondisclosures. The Missouri Supreme Court, however, overturned the Court of Appeals and reinstated the verdict. The court refused to “disturb the circuit court’s ruling” and deferred to its findings during the evidentiary hearing – choosing to believe the court clerk over the two defense attorneys. In its opinion, the court stated that the ruling was not “against the logic of circumstances” or “arbitrary and unreasonable as to shock the sense of justice,” setting a dangerous precedent for juror misconduct moving forward. While the need for judicial reform in Missouri is evident, the propect for change is bleak. The plaintiffs’ bar exercises disproportionate influence within the system that appoints Missouri judges to the bench at all levels. This so-called Missouri Plan was adopted in 1940 and functioned more or less evenhandedly until about 30 years ago. Since then, the system has been captured by plaintiffs’ lawyers with predictable results. Missouri’s appellate judges are appointed by a seven-member panel. The Appellate Judicial Commission’s membership is set by the Missouri Constitution. It includes three non-lawyers appointed by the governor, three lawyers elected by the Missouri Bar Association, and the chief justice of the Missouri Supreme Court, each of whom serves a staggered six-year term. In practice, this purportedly “nonpartisan” court appointment plan ensures that the liability-expanding interests of plaintiffs’ lawyers are disproportionately represented. Over the past two decades, every panel between 2002 and 2012 included at least one former member of the Board of Governors of the Missouri Association of Trial Attorneys. of civil liabilty. Two of the non-lawyers appointed by Governor Jay Nixon (D) are a union representative and a Democratic party staffer, both of whom consistently seek to appoint liability-expanding judges. The final member of the commission is a nurse and former paralegal at a plaintiffs’ firm. Appointed in 2015, she replaced the commit- tee’s only businessman who consistently supported judicial candidates favoring reasonable limits on liability. Trial lawyers have spent millions of dollars on advertising to attract plainitffs to the “Show-Me-Your-Lawsuit” state. In the second quarter of 2018 alone, they spent $186 million on advertisements nationwide. Television viewers in the St. Louis media market saw about 14,000 locally broadcast ads by lawyers, law firms and others soliciting legal claims in the second quarter purchased at an estimated cost of $860,000 — an average of 12 ads per day during this time or nine times as many ads as those for pizza delivery and restaurants. The sheer volume of ads has led to concern that plaintiffs’ lawyers have tainted the jury pool in St. Louis against the businesses they sue. Republican leadership introduced a strong, desperately-needed legal reform agenda for Missouri’s 2018 legislative session, but when it came time to deliver, legislators failed miserably. Trial lawyers were able to infiltrate the legisla- ture and affectively stymy the efforts. Among the reforms considered were venue reform, amendments to the Missouri Merchandising Practices Act (MMPA), legislation to allow evidence of seatbelt non-use, punitive damages reform, and an asbestos trust transparency bill. First introduced eight years ago, venue reform legislation is arguably the reform that is most desperately needed to address lawsuit abuse in St. Louis. As discussed earler, plaintiffs are flocking to St. Louis from all over the country because of the lax venue rules and the potential for large awards. S.B. 546/H.B. 1578 would have restricted the ability of plaintiffs’ lawyers to combine the claims of out-of-state clients with those of Missouri residents. The bill was in line with the U.S. Supreme Court’s monumental 2017 Bristol Myers Squibb decision, which unfortunately, St. Louis judges have been slow to apply. Another proposal that the Missouri legislature has considered over multiple sessions and failed once again is legislation to amend the state’s lawsuit-generating consumer law, the MMPA, discussed above. The 2018 legislation, S.B. 832, would have reduced the opportunity for “no-injury” lawsuits and attorney-generated litigation. Claims that a business practice is misleading would be evaulated from the perspective of a “reasonable consumer” and there would be no award of damages unless consumers have actually lost money. The bill also would have required any fees awarded to lawyers who bring these class actions to have a reasonable relationship to the amount of the judgment—making more likely that these lawsuits provide a benefit to consumers, not just the lawyers who file them. Everyone knows that wearing a seatbelt significantly reduces the chance of being seriously injured or killed in a car accident. For that reason, the law requires wearing seatbelts. In Missouri, however, an outdated law allows courts to reduce the damages of a person who did not wear a seatbelt—but only by 1%. Legislation introduced in 2018, S.B. 822, would have allowed a jury to consider evidence of a plaintiff ‘s failure to wear a seatbelt when deciding who is at fault for injuries resulting from auto accidents. The bill appropriately would have allowed a jury to place some of the responsibility on the plaintiff for actively choosing not to wear his or her seatbelt. Even after the bill was significantly narrowed to apply only in product liability actions, it did not receive a floor vote. The legislature had the opportunity to restore punitive damages to their intentional tort roots to provide clear notice of conduct that may result in punishment, like a speed limit sign on the highway. H.B. 2119 provided that punitive damages should be available based only on clear and convincing evidence that the defendant intentionally harmed the plaintiff without just cause or acted with a deliberate and flagrant disregard for the safety of others. As with the other bills, it did not receive a floor vote in the Senate. The legislature also failed to enact asbestos trust transparency reform. This legislation would have prevented plaintiffs’ lawyers from alleging that insolvent companies are responsible for their clients’ exposure to asbestos in order to obtain compensation from trusts set up by those companies, then hide this information when suing solvent companies in court. St. Louis had the 6th most asbestos lawsuit filings of any jurisdiction in the country in 2017, according to evaluated firm KCIC. St. Louis held this rank despite a 40% decrease in filings. This drop occurred primarily due to weak cases alleging asbestos caused lung cancer flowing to neighboring Judicial Hellhole, St. Clair County, Illinois. 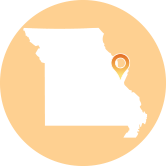 This shift likely is a positive result of Missouri’s adoption of a stronger standard for expert testimony in 2017. While the legislature bears much of the blame for the lack of progress in 2018, the disgraced governor and the multitude of scandals surrounding his office certainly did not help. After being indicted on felony charges of invasion of privacy and accused by prosecutors of misusing his charity’s donor list for political purposes, Governor Eric Greitens (R) resigned on May 29, 2018. Prior to his resignation, the legislature launched a bipartisan investigation that produced an extremely disturbing report detailing a coercive extramarital affair and threats of blackmail. Governor Greitens was replaced by his Lieutenant Governor, Michael Parson, who by all accounts is open to addressing legal reform in the future. In the midst of all of the chaos surrounding the Missouri capitol, the legislature enacted one significant piece of reform legislation. H.B. 1531 builds on earlier reforms that increase transparency and protects the public purse when the state hires private attorneys on a contingency fee basis. State hiring of private contingency fee lawyers has too often led to pay-to-play corruption of the civil justice system. In 2011, Missouri adopted a law to reduce such abuse by providing an open process for the state to hire outside counsel. This process includes explaining the need for hiring private attorneys, soliciting written proposals from firms interested in doing the work, and posting the resulting contract and payments on a public website. The law requires government lawyers who serve the public, not private lawyers motivated by profit, to control the course of the litigation and approve any settlement. The new law strengthens this system. Like many other states that have adopted similar reforms, H.B. 1531 protects taxpayers by ensuring that a few private lawyers do not siphon an excessive portion of the state’s recovery. The new law provides a sliding scale for attorneys’ fees that is based on the amount recovered and does not allow a fee above $10 million. It also protects due process by providing that lawyers may not receive a percentage of the civil penalties or fines imposed—reducing the incentive to inflict the greatest punishment for the highest profit.